Amid all the busyness of life in our home, we unmistakably felt the Lord burdening our hearts in an area that concerns Him greatly. 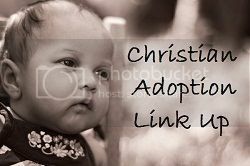 Very early in 2010, we started praying about the possibility of adoption. I know – crazy for us to think about with 4 busy, young boys, right?? But God has continued to open our eyes to the needs of the fatherless. We cannot possibly make a dent in the problem, but we can certainly make a difference in the life of one! Because we have received God’s great grace and mercy, we want to extend that mercy to another. Somewhere there is a little girl in need of her forever family, and we are starting to take the steps to find her. Please pray for us! We still have not narrowed down a country, so many more exciting decisions will need to be made soon. We have taken the training required by NB for international adoption, so the next step will be loads of paperwork, a homestudy, and choosing our agency/country. We have learned much as we’ve researched, contemplated, and prayed about adoption this year. It affords such a glorious picture of the Gospel in tangible form for us to grasp! God’s design all along for redemption’s plan included , not only forgiveness and justification, but also adoption as His children – belonging to a NEW family, having a NEW name, and a NEW inheritance!